A stir fry is a busy girl’s best friend. You can whip one up in 30 minutes or less, in a single pan, and get a meal that may have cost you $12 in a restaurant for, well, a lot less. Plus it’s the perfect meal to get in a ton a nutrients with lots of fresh veggies. I’m a big fan of recipes with minimal rules and instructions to follow. And with a stir fry, just about anything goes. You can use the ingredients I did here, or change it up to incorporate your favorites. Use whatever happens to be in your fridge or freezer (yep, frozen’s just fine) or buy what’s in season (read: on sale) and invent your own. First, combine all of the sauce ingredients in a bowl and stir. Set aside. 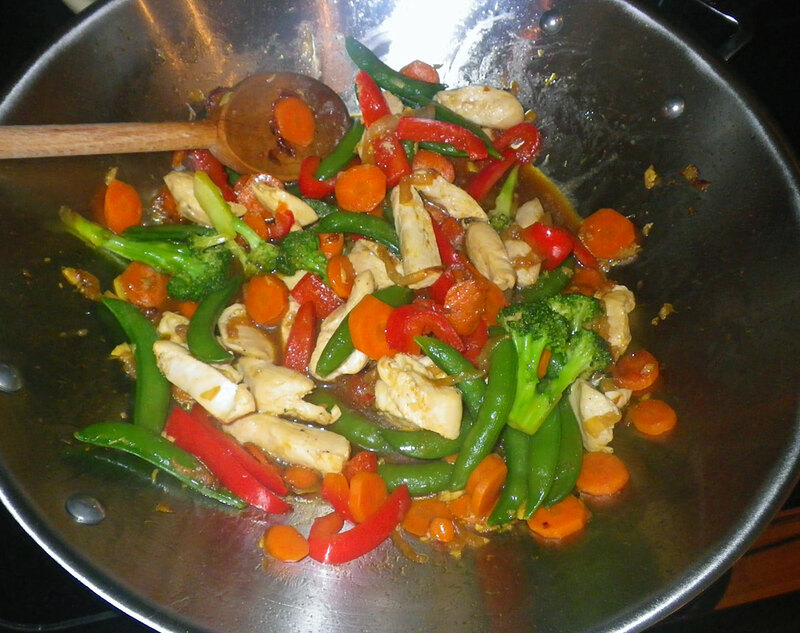 For the stir fry, start by heating the wok over medium heat, then add olive oil. When the oil is hot, add the onions and saute, stirring occasionally, until they brown slightly. Add the vegetables, starting with the carrots and bell peppers and stir. Cook 2-3 minutes, until they begin to soften. Add the broccoli, snap peas, cook another 2-3 minutes. Add 1/4 cup of water at any point if the pan becomes too dry. Allow the vegetables to absorb the water. When the vegetables are cooked through, add the chicken. Then stir in the sauce. Serve as is or on top of brown rice. For more time and money saving tips that apply to this recipe, check out my post over on Glass Heel. I’ve just started contributing to the new career, lifestyle and networking site for professional women. Check it out.